Climate change is resulting in severe droughts in some parts of the world. The Vetiver System if applied and managed as a forage crop could provide communities and farmers greater resilience and protection. Analysis of vetiver leaf shows that at a young stage its nutritional value is as good as the popular tropical grasses such as Rhodes, Napier, Star, Kikuyu and others. The key question is how to manage vetiver in order to produce a quality forage. Small farmers in Gundalpet, south India, know - they cut their vetiver hedges every three weeks - great forage! We need to apply an appropriate management approach, probably following controlled strip grazing or rotational grazing practices, for those farmers who could use vetiver as a forage crop at large scale. Here follows an interesting and related story from Raphael Luque of Venezuela titled "Vetiver Saved My Herd"
"For more than 15 years I have been usingVetiver grass (Chrysopogon zizanioides) for bioengineering applications as part of my environmental related business, 'Vetiver AntiErosion'. I am also a farmer. Initially I owned a 1 ha fish pond. Later I moved to better land located in Las Majaguas, Edo, Portuguesa, Venezuela where I planted 6 ha of vetiver. After a few years, I had added 18 ha of sugar cane, but for political-economical reasons, that are beside the point, I switched to dairy ranching, designating 4 ha for other crops, and because the sugar cane had higher calorific value but less proteins, I reserved 18.5 ha for pastures and foraging crops. In working with the Pastoreo Racional Voisin (PRV) this past year, we sowed, during the rainy season, 8 ha of African Star Grass (Photo 1) and divided the area with electric fences into many small pastures. Likewise we sowed a number of forage trees and fruits. At the beginning all went according to the plan (Photo 2), but unexpected sickness afflicted me and José Gregorio, my son who partners me in this project, and we were absent from the farm for 4 months. Due to the distance between the farm and my home, nobody from the family could supervise what was happening there. What came next is easy to understand for any Venezuelan rancher, and Latin Americans in general, thus I will only go into details about what happened with the facilities, the pasture, and the animals. We returned to the farm during the time of drought. After having gone around the farm, we found that all wire fencing had been unraveled and in the soil (Photos 3 and 4). The animals had entered all of the pastures as they please and had eaten the grass before it had developed. Hardly any survived except 1 ha that was eaten to the ground. In brief, there was no foliage to eat (Photos 5, 6, and 7). With virtually nothing to eat the cattle were thin (Photo 8), moreover, only 2 cows were producing milk, (about 8 liters/day). My first reaction was to sell the herd, so I put announcements in the press. However, potential buyers lost interest once they knew that the majority of the cows were dry (not producing milk). Others offered to buy them at very low prices in order to take them to the slaughter house. I then decided on a plan B: Buy concentrated food to supplement those cows that had just given birth and the thinnest, and also buy bales of Brachiaria humidicola (a grass commonly used as hay in East Venezuela) at the cost of 850 Bs (134 USD) for each bale, that hardly lasts 1 day per 33 animals. For reference, the price of 1 liter of milk was 25 Bs. Thus, it is necessary to produce 34 liters and my cows were only giving 8 liters per day. Soon I realized that financially I could not support this. By good luck, on the border of the farm grew rice, so I began to cultivate it and supply it to the animals even though the nutritional value of these young shoots of rice is very low. 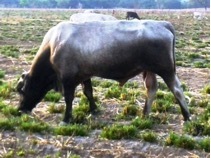 I observed that the cows were going to the 6 ha vetiver area frequently, but they spent little time in the other crops. I observed that the animals ate very little of the mature vetiver leaves (Photos 12 and 13). I had little hope for the vetiver, due to the presence of silica in the leaves and low palatability when mature. At this time, halfway through summer, it was almost dry. I had heard that in the Apure state, and also I had read that in Africa, the cattle eat vetiver during the summer. I visited the TVNI website (www.vetiver.org), the library of vetiver, where I found an Australian study where they compared the nutritional value of vetiver with the grasses Rhodes and Kikuyu, obtaining results at par with the other grasses (see Appendix A). To continue, I proceeded to plan C, one that was never in my mind. I burned 3 ha of vetiver and cut the stems that remained after the fire with the objective to stimulate faster sprouting of the grass (Photo 14). After five days, the cattle began to enter the area, meanwhile, the new foreman suggested that I wait longer for it. From prior experience, I knew that the vetiver, under these conditions, has a growth rate of 3 to 5 cm/day and for that I told him: “Don't worry, the vetiver will grow more quickly than the hunger of the cows.” Initially, they spent little time in the fire zone (Photo 15), but as the vetiver grew, they began to spend half the day there (Photos 16, 17, and 18), and the other half of the day they were grazing in an area of trees and pastures with weeds and dry grass.